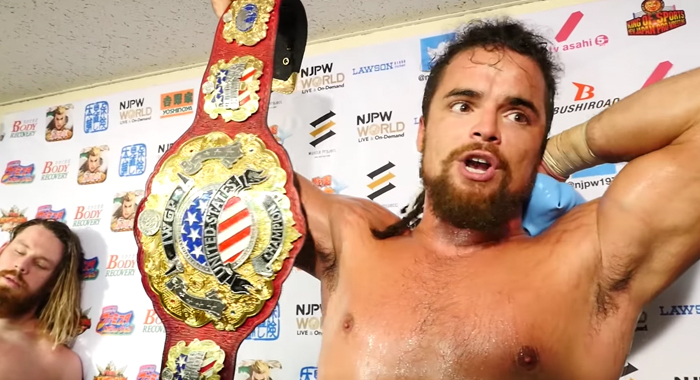 New Japan Pro-Wrestling has officially announced that Juice Robinson will defend the IWGP U.S. Heavyweight Championship on Sunday, March 24th in Niigata at the New Japan Cup Finals. His opponent will be Bullet Club member Chase Owens, who scored an upset victory over Robinson in the first round of the tournament, before himself being eliminated by Yoshi-Hashi in the second round. Obviously the finals of the New Japan Cup will also be decided at that show, with the winner going on to face Jay White for the IWGP Heavyweight Championship at G1 Supercard in Madison Square Garden. The rest of the match card has not yet been announced, as it remains to be seen who will be available for undercard matches, and which stars will still be alive in the tournament. Right now, the final eight competitors going into the quarterfinal round (which begins on Wednesday) are Yoshi-Hashi, Tomohiro Ishii, Kazuchika Okada, Will Ospreay, Hiroshi Tanahashi, Zack Sabre Jr. (who upset Kota Ibushi in the second round), Sanada and Colt Cabana.